Trying to find wholesale metal poster frames that have sleek finishes to match the décor in the home, office, business or other establishment? The custom picture displays are available in classic finishes that will add a sense of elegance to any room that features graphics. Wall framing options feature sleek black and metallic silver coating that heighten the prominence of the important images and messages. Fixtures for signs are certain to complement the overall aesthetic of the promotional campaign without detracting from the wonderful advertisements within the displays. These silver and black metal poster frames, often referred to as aluminum sign holders, can be instrumental when marketing upcoming events, promoting goods and services, branding a company name or providing way finding information. 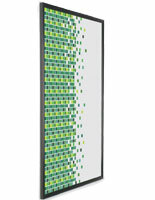 The fixtures for signs come in different sizes to best accommodate the graphic to be showcased. Custom picture displays present small door signage, standard sized movie prints and large banners behind protective lenses. 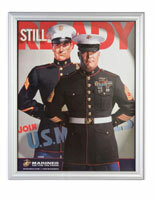 These metal poster frames are wall framing options that can be setup in a lobby, near doorways, above retail fixtures and any other highly visible space in the building. The aluminum sign holders feature durable constructions to withstand frequent use in areas that receive heavy foot traffic. Professional frames have designs that make it simple for users to make signage changes. Aluminum sign holders come in snap frame, slide-in and traditional styles to allow users to easily open the units. These frames may include mat boards to further accent the intriguing art prints, movie ads, messages and other signage. Custom picture displays of this ilk will not damage the wall and can be setup in a matter of moments. How does a user load signage into the aluminum sign holders? These metal poster frames come in a few different designs. Each of the styles accepts images a little differently, but all of the constructions are very intuitive. Traditional black and silver framing features a read loading design. Advertisers should be very familiar with the loading process with these units. Simply open the back, load the picture and seal the framing shut. 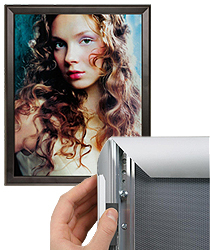 Some wall mount signage fixtures include a hinged front for quickly inserting and uninstalling pictures. The swing open framing allows users to access the interior by simply pulling on the front. The process is the same as opening a hinged door. Another front loading design available for purchase is the snap framing options. 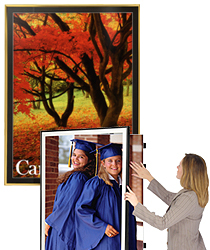 These custom picture displays have hinges in the borders for convenient installation. Users need to flip open the four sides and position the graphic. Snap the framing shut for a great look. 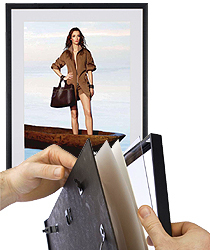 Slide-in picture displays come in different sizes and make the showcasing process incredibly easy. These custom framing options have openings in the side or top for carefully inserting the graphics. Inserting the signage will take a couple seconds at the most. 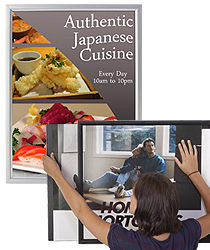 These metal poster borders can be setup on almost any flat surface in the establishment, so users can fill voids on most walls. The units come in various sizes to prevent against too much negative space in the advertising campaign. Hanging the framing options is incredibly simple. All of the borders come with metal hangers on the back. Users need to post a nail, screw or other sturdy piece of hardware into the wall. Advertisers and retailers are then ready to hang the metal poster borders in the desired position. Many of the silver and black framing products can be presented in landscape or portrait orientation to match the format of the content. The aluminum designs bring a touch of class to the graphics and the establishment.